Hello friend which artical i am going to share with you that's for world smallest and light weigth mobile phone . which is so attractive and awesome. you will shocked to see this phone and it's features . mean how can someone make this small LCD, KEYPADS, BATTERY ect. it just measure by our little finger. amazing phone by kechaoda.It is the smallest phone in the world. Used as a bluetooth ear-phone for making a call, listening to music, hands free from mobile phone and tablet pc. 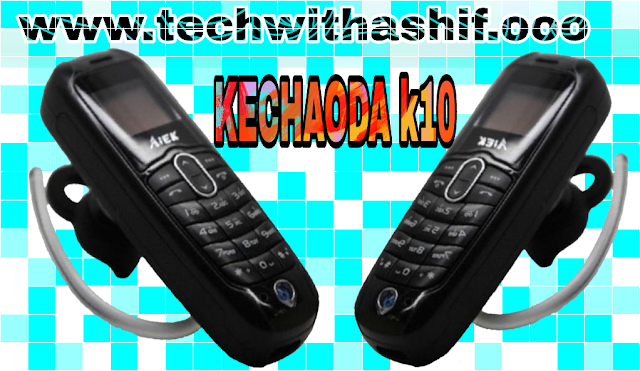 There's nothing more attractive than a combination of simple features and handy design when it comes to a mobile phone, which is why this finger Bluetooth phone K10 phone from KECHAODA is sure to take you by surprise. Battery: 300 mah powerful battery for your phone Language Support. This supports 4 regional languages as English,Hindi,Tamil,Gujarati Memory: 32 MB Internal memory, 32 MB RAM OTHER FEATURES. FM wireless, Bluetooth dialler, Blueooth headset, Finger Bluetooth phone. 1 year Warranty on the product. This phone is so tinny and looks amazing attractive. if you see this phone, you think i should buy it as soon as possible really awesome. You can buy it from Amazon.in only spend amount 990 Rs. you can also use it like Bluetooth headset. Can be used as a bluetooth ear-phone for making a call, listening to music, hands-free from mobile phone and tablet PC. It can be hung to be ûsed as a bluetooth on the ear. Works on frequency: GSM 850/900/1800/1900MHz. It only support 2G (GSM). It’s Unavailable to access Facebook and Twitter. It have a speaker and mic, so it can be used as a independent main cell-phone when insert a Micro-SIM card. Very prâctical to use when traveling or using as a spare cell-phone in the car. Please rip off the yellow tape on the battery before use it, or it does not work. This is the smallest-phone in the world. Comes with the micro USB cable, you can use any charger to charge it. I hope you feel happy to read my article and satisfied. keep supporting me and my web page. please follow my website.